Dale Steyn took career best figures of 11-60 in the match as South Africa thrashed Pakistan by 211 runs to go 1-0 up in the three Test series. The paceman followed up his first innings 6-8 with five more dismissals in the second innings as the tourists were bowled out for 268. 11-60 (2013 v Pakistan, Johannesburg). 10-91 (2007 v New Zealand, Centurion). 10-93 (2007 v New Zealand, Johannesburg). 10-108 (2010 v India, Nagpur). 10-154 (2008 v Australia, Melbourne). Steyn, the number Test one bowler, ensured Pakistan's first innings of 49 was their lowest ever Test score. Keeper AB de Villiers' 11 dismissals also equalled the Test record. That was set by England's Jack Russell at the same Wanderers ground in Johannesburg back in 1995. De Villiers completed a fine personal match by scoring 103 not out to set Pakistan an improbable victory target of 480. After half centuries from Misbah-ul-Haq and Asad Shafiq, Steyn did the damage with the new ball to collect his 10th five-wicket haul as Pakistan lost six wickets for 59 to subside to defeat with five sessions still remaining. 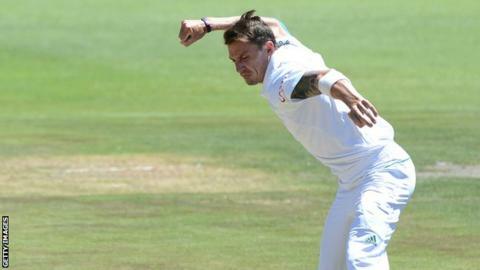 "It was just one of those Test matches where things go right for you," said Steyn. "Sometimes you beat the bat all day, other days you get a few edges. But I bowled pretty well, obviously!" "Dale was outstanding, it was important that someone set the tone for us with the ball and he did that," said South Africa captain Graeme Smith, leading the side for the 100th time in Tests. "Everybody followed suit afterwards." The second Test, in Cape Town, starts on Thursday 14 February.